Free Shipping Included! KingCamp Heavy Duty Steel Camping Director's Folding Chair with Carry Bag and Cooler Bag by KingCamp at Kerinci. MPN: 6927194746153. Hurry! Limited time offer. Offer valid only while supplies last. 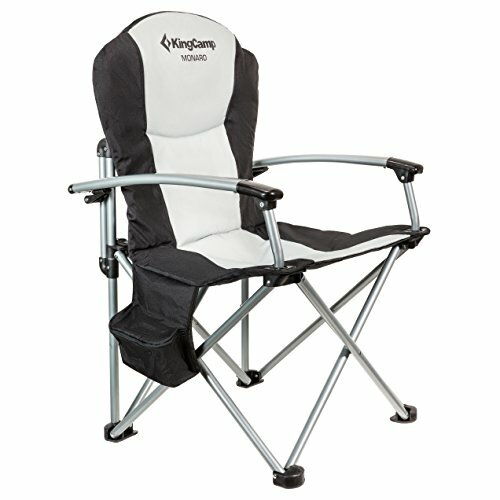 This KingCamp folding chair is very comfortable when you sit in. No assembling tools would be needed, the chair is easy to open or fold in seconds. This KingCamp folding chair is very comfortable when you sit in. No assembling tools would be needed, the chair is easy to open or fold in seconds. It has a cooler bag which is like a thermostat to keep the temperature constant. Delicate and smooth armrest is stylish and convenient for you to have a rest. High strength steel tubes bracket structure design makes it very stable. Portable and light enough to be carried like a small luggage, this chair fits in most car trunks. Perfect to be used indoors or outdoor activities such as picnic, camping, beach, patio parties, fishing. Heavy duty steel frame, aluminum arms, weights 11.2 lbs, supports up to 353 lbs (160 kg). Cooler bag keeps your drinks fresh and at hand. Open and close in seconds, packed size 35.4 × 8.9 × 8.3 inches, space saving, easy to carry and store with carry bag and compact straps. Seat Height 18.5 inches; Width 21.7 inches; Idea for big guys camping, hiking, home and any outdoor activities.